From huge, globe-like white cabbages and to geometric Romanesco to tiny Brussels sprouts – there are few vegetables as versatile as cabbage. And of course, they have a few handy details in common: they you keep full, are packed with vitamins, and have finally recovered from their when-times-are-hard reputation. With that in mind, let us introduce you to 11 of the most popular varieties in the brassica family! Do you have a favorite cabbage type or any special recipes? Share all cabbage love in the comments below! There’s a reason why us Germans are often called ‘krauts’ – we eat 350,000 tons of it every year, with the majority of the harvest processed into sauerkraut. Surprisingly though, most cabbages, don’t originate from Germany but from the Mediterranean region. Since not only are they inexpensive, but also big enough to nourish even an extended family, it’s no surprise that white cabbage is one of the most popular types of cabbage worldwide. Why you should eat white cabbage more often: White cabbage is cheap, tasty, versatile, and healthy. Like all cabbages, it contains a lot of vitamin C, as well as vitamin K, selenium, potassium and magnesium. Stored in the fridge, it lasts approx. 1 – 2 months. If you still have any leftovers, you can also freeze white cabbage. To do this, first clean the cabbage, then cut into strips and blanch for approx. 6 – 8 min in boiling water. Next, blanch it in ice water, and let drip dry. Packed in an airtight container, it will last in the freezer for up to 6 months. Cook a classic: German grandmothers are often famous for their stuffed cabbage rolls, usually from a well-kept family recipe. White cabbage’s sizeable leaves can easily be filled with ground meat, rice, fried vegetables, feta cheese, and more stuffings! ...Or try out something new: From borscht to coleslaw, there are excellent white cabbage recipes in many cuisines around the world. Its crunchy leaves make white cabbage the ideal choice for cabbage salad and soups, because they will keep their bite even after cooking. In many European cuisines, it is traditionally spiced with caraway seeds, which also make white cabbage more easily digestible. Pointed cabbage is a variant of white cabbage and has a slightly sweetish flavor. Due to its delicate leaves, it is not as durable as white cabbage and should be eaten after a maximum of 3 days. It is best stored wrapped in a damp kitchen towel in the vegetable compartment of your fridge. Why you should eat pointed cabbage more often: Healthy pointed cabbage also contains plenty of vitamin C and is being low in calories and fat – it’s also one of the most easily digestible types of cabbage. You can prepare it similarly to white cabbage, but keep in mind you won’t need to cook it as long. If you want to freeze pointed cabbage, cut it into smaller pieces and blanch in boiling water for approx. 2- 3 minutes. Stored in the freezer, it will keep for up to half a year. How to prepare pointed cabbage: Remove the outer leaves of the pointed cabbage, then quarter it. This way, the stalk can be easily removed and you can cut the pointed cabbage into larger pieces or strips according to the recipe you’re cooking. For a quick stir-fry, combine it with bacon and carrots or use the tender leaves for cabbage rolls. Steamed pointed cabbage is also a great side dish to ‘spätzle’ or potato dumplings. In many countries, red cabbage is THE festive cabbage and sadly lives in the shadows for the rest of the year – what a shame! With its bright violet color, red cabbage is one of the visual highlights of the cabbage family. Sweet ingredients will turn it a bluish violet during cooking, while acid-rich ingredients turn it reddish. Want to know more about red cabbage? Then check out our article ‘In Season: Red cabbage’ to find all information on how to shop, store, and prepare it. Why you should eat red cabbage more often: Instead of shining as a festive side dish, red cabbage cuts a really good figure as the main component of your meal. 100 g / 3.5 oz of red cabbage covers the complete daily requirement of vitamin C and strengthens your immune system in the cold season. As most people find it difficult to digest, cook it with some caraway seeds or ginger to aid the digestive process. Cook a German classic: Making homemade red cabbage is easier than you think. It’s typically seasoned with allspice, juniper berries, cloves, or bay leaves and sweetened with jam or cut apple. Serve it as a side dish to duck breast and potatoes to enjoy a hearty Sunday dinner. ...Or try out something new: Those without sensitive stomachs: Try delicious red cabbage raw in a crunchy salad with a creamy poppy seed dressing. Everyone else can enjoy it fried as red cabbage steaks, baked, mushroom-stuffed or braised. The once old-fashioned kale has made a fabulous comeback in recent years. All of a sudden, kale chips, kale smoothies and more settled in the supermarket, ensuring the love of kale would not be lost! Unlike white or red cabbage, kale leaves don’t grow in the form of a head but on the stem. After a little restorative massage session with some oil, an acid like lemon or vinegar, and some salt, kale can also be eaten raw. Learn more about kale in our dedicated article. Why you should eat kale more often: In addition to the prospect of likes and clicks on your Instagram, your body will be happy about an increasing consumption of kale. There’s hardly any other vegetable that contains so much vitamin C: 100 g / 3.5 oz of kale cover more than the recommended daily requirement. It also contains important fiber, minerals, vitamin K and vitamin E, is rich in antioxidants and low in calories and fat. To be honest, is there any reason to not eat kale? Cook a German classic: Our grandparents swore by kale with ‘Pinkel’, a smoked, coarse sausage or combined it with smoked pork loin and potatoes. ...Or try out something new: Delve into the modern fairy kale…Here’s how to make crispy kale chips, a fresh kale salad with chickpeas, and a healthy kale and almond smoothie. Or how about irresistibly delicious gnocchi with kale pesto? Since they’re as huge as a white or red cabbage, yet finer and more delicate in taste and their frilly texture, it’s no surprise that savoy cabbage made it into the world of fine dining. After the rise of the kale, savoy cabbage is considered the next serious contender to ascend to the most-popular cabbage throne. Why you should eat savoy cabbage more often: Savoy cabbage is a real vitamin bomb and contains not only a lot of vitamin C, but also vitamin A, which is good for your skin and eyes. 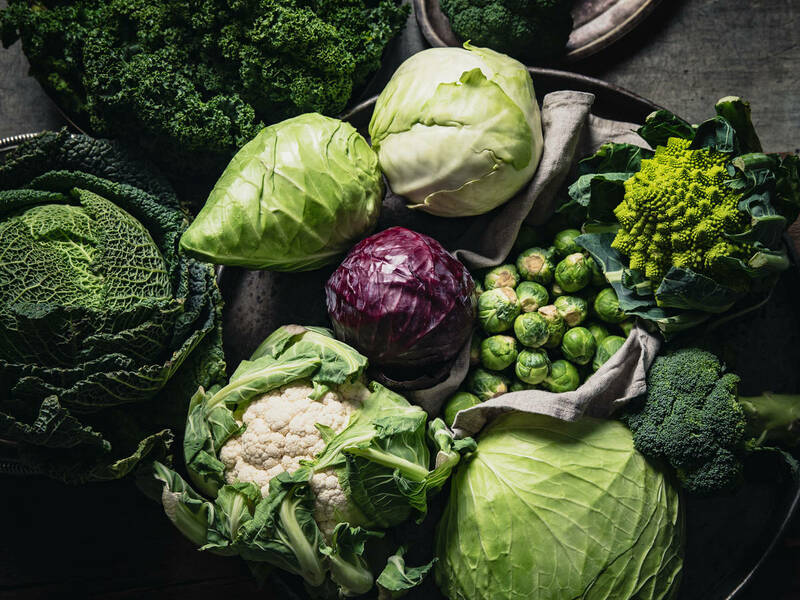 Vitamin B6 strengthens the nerves and immune system and the ‘mustard oils’, found across the cabbage family, are often called natural antibiotics as they can work against viruses and bacteria. Savoy cabbage also scores well in terms of versatility: It can be eaten raw, boiled, blanched, and filled. Thanks to its short cooking time, it’s a great choice for quick, hearty dishes. Our favorite recipes with savoy cabbage: Since the leaves of savoy cabbage don’t need much time to cook, they are a good choice for quick stews. This hearty combination with minced meat and potatoes is already a classic. Or try this savoy cabbage quiche with tangy Alpine cheese. With this recipe, you not only get a decent portion of savoy cabbage, but it also comes in different textures. While one part is cooked into a creamy savoy cabbage bed for the perch fillet, the remaining cabbage leaves roast in the oven until they are really crispy. If someone had told me as a child that one day cauliflower would be my favorite cabbage, I probably would have thought them crazy. What I didn't know for a long time was that not only can you eat the florets, but also the stem and the cauliflower leaves, if you clean them thoroughly beforehand. They are even more nutritious and flavorful than the florets. Why you should eat cauliflower more often: The more easily-digestible cauliflower is rich in vitamin C and vitamin K, and contains important minerals such as potassium, phosphorus, sodium and iron. Just like savoy cabbage, it also scores highly with its mustard oils, which can work against free radicals and bacteria. Like all cabbages, it is low in calories and fat, but if you’re looking for a way to add some, here’s a Hollandaise or Béchamel sauce. Yum. Our favorite recipes with cauliflower: Cauliflower is a real chameleon, because while other cabbage varieties are versatile in their uses, cauliflower is sometimes barely recognizable in its different forms. The cabbage with a thousand faces can be processed into cauliflower rice, pizza crust, cauliflower bolognese, steaks, sauces and much more. Try one of these recipes and make cauliflower your secret-favorite cabbage, too! Like most people, I disliked Brussels sprouts when I was a kid and wondered why people would eat these mushy, bitter, green balls. Only years later did I realize that it was simply a matter of preparation and not the Brussels sprouts themselves that were to blame. With the right technique, these guys become little delicacies. Read our article ‘In Season: Brussels sprouts’ to find out where Brussels sprouts get their name from and more tips and tricks. Why you should eat Brussels sprouts more often: Although some people often advise against eating Brussels sprouts raw, it’s definitely possible. However, as they are difficult to digest, it’s best to finely grate them and only eat a small amount. If you want to be on the safe side, blanch the Brussels sprouts and toss them in melted butter, or roast them in a frying pan or oven. The bitter taste can easily be balanced with a little sugar or honey. Try out something new: Fried, buttery Brussels sprouts are our personal tip to take a classic Carbonara to a new level! Romanesco is a piece of art among cabbages—our community member Tim Seo wrote in, quite on point, that they were, in fact, “too cool to eat’. But although we’re just as impressed by its unique appearance, we love to cook with Romanesco, too! It can be used for salads, soups, or delicious fritters. How to prepare Romanesco: Many people are confused about how to prepare Romanesco, but it’s much easier than you think. Just like preparing cauliflower, remove the stalk and outer leaves first, then cut the Romanesco in florets. Our article ‘In Season: Romanesco’ tells you everything you need to about how to find the perfect Romanesco, which herbs to pair it with, and much more. Our favorite recipes with Romanesco: Romanesco is not only a feast for the eyes, but also one of the more easily-digestible types of cabbage—you can even eat it raw if you have a young Romanesco cabbage. In terms of taste, it ranks between cauliflower and broccoli and will have a stronger cabbage flavor the longer you cook it. With recipes like our Romanesco soup with walnut-mint pesto or crispy Romanesco pancakes, you’ll convice even the biggest sceptics. My parents have been planting and harvesting kohlrabi in their garden for many years, so I’ve been eating this delicious vegetable raw since my childhood. Only years later did I start to actually cook with it—and not only with the bulb. If cleaned thoroughly first, you can also use the stems and leaves by blanching and frying them, or use them in stews, soups or, salads. Learn more about kohlrabi in our article ‚In Season: Kohlrabi'. Why you should eat kohlrabi more often: Of all the types of brassicas, kohlrabi is one of the mildest and best digestible ones, and tastes slightly sweet. Just 100 g / 3.5 oz kohlrabi already gives you the recommended daily dose of vitamin C. In addition, it contains lots of vitamin A, vitamin K, and folic acid. It’s mustard oils have a positive effect on sensitive stomachs and intestines. And did you know that the leaves actually contain more vitamins and minerals than the bulb? With that in mind, make sure to use them too and don’t throw them away. Cook a modern classic: Cutlets aren’t limited to veal or pork—sliced kohlrabi is a fabulous vegetarian alternative to a Wiener Schnitzel. In this recipe, it’s wrapped in Parma ham, but if you’re looking for a vegetarian version, just leave it out and bread the blanched kohlrabi as it is. ... Or try out something new: From hearty casseroles with potatoes, a creamy mashed side dish to trout, to a crisp and fresh salad with an Asian-style dressing: These recipes cover the full cooking range of kohlrabi! It looks like a flattened version of white cabbage, and in fact, it is exactly that! The unique breed is something of a precursor to the white cabbage we know, but is slightly less bitter in taste. Though you might not be familiar with it, it’s been enjoying a comeback in the last 20 or so years and is getting more and more popular. We’ll bet you’ll be on the lookout for it after reading this article. Why you should eat jaroma cabbage more often: Jaroma cabbage scores highly in numerous categories—let’s start with the nice fact that it doesn’t develop that typical cabbage odor while cooking. Similar to pointed cabbage, the leaves of Jaroma cabbage are super tender so you don’t even need to blanch them before using the leaves for stuffed cabbage rolls. With other preparation methods, it also just takes a few minutes to cook and is therefore an excellent cabbage choice for quick dishes. It is also much easier to digest than white or red cabbage, so you can enjoy it raw in salads, too. Stored in the fridge, you can keep it for up to a month. So why not substitute the white cabbage in this recipe with jaroma cabbage to make a tasty coleslaw? Although many people’s favorite brassica, broccoli is somewhat of a newcomer to American cuisine. It wasn’t until the 1920s that broccoli was introduced by Italian immigrants, but it conquered hearts fast—even children are kindly to the tree-like vegetable. It’s also good to know that you can use the stalks, as well as the florets, for cooking. Why you should eat broccoli more often: If you’re not a big fan of the typical taste of cabbage (and have read this article up to here), you’ll still find great pleasure in eating broccoli. It’s not called ‘asparagus cabbage’ in some places just by chance, but tastes similar to the spring vegetable. Additionally, it’s rich in vitamin C, contains calcium, carotene, and magnesium. Our favorite recipes with broccoli: Broccoli soups are almost a classic – in this recipe, it heads to Asia by way of Hoisin sauce, cilantro, and sesame seeds. Or how about a broccoli pizza – who could resist the combination of tangy gorgonzola, crunchy almonds, and creamy mascarpone, right? Last but not least, here's my favorite broccoli recipe. Although I don’t have an official statistic on this, I could bet that I cook this recipe at least once a month. In contrast to other cabbage types, broccoli florets will still retain a wonderful bite even when you sear them.